As day trader, you need to always be looking for ways to improve your edge.The NYSE Tick is the perfect trading indicator to do just that by improving your entry points on trades. A tick is the minimum movement either up or down of a security. Since 2001 the minimum movement for stocks trading above $1 has been 1 cent. If you trade Forex a tick is similar to a pip which is equal to 0.0001 for currencies that are traded to 4 decimal places. Future contracts have different tick values depending on the security your trading. You can look up contract specs for eMini products at http://www.cmegroup.com/. A security is considered to be on an uptick when the last price traded is higher than the previous price. 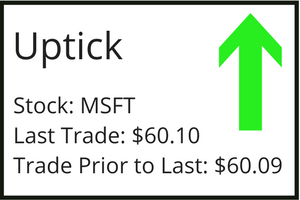 For example, the last trade on Microsoft (MSFT) was $60.10 and the trade prior to that was at $60.09. MSFT would currently be on an uptick. Opposite of an uptick, a security is considered to be on a downtick when the last price traded is lower than the previous price. 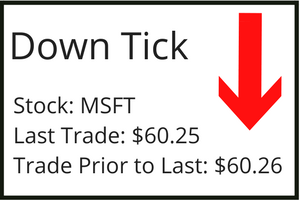 For example, the last trade on MSFT was $60.25 and the trade prior to that was at $60.26. MSFT would currently be on a downtick. Now that you have an understanding of what a tick is, it’s time to put it all together. The NYSE Tick Index is a calculation of all the NYSE stocks on upticks less all of the stocks on downticks. The NYSE Tick provides you an overall view of market sentiment in the short term. You are able to see the number of ticking “up” versus “down” stocks very easily. This is beneficial as a day trader when you need to make quick decisions. 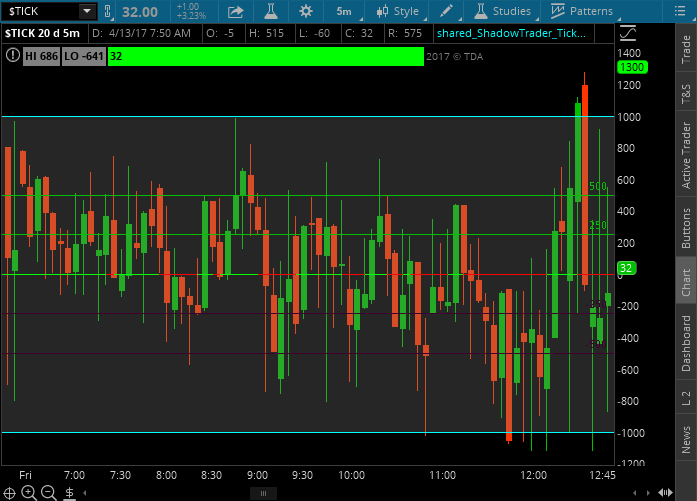 The chart above is from the ThinkorSwim platform and the NYSE Tick ($TICK). I simply added some horizontal lines at 0, 250, -250, 500, -500, 1000, & -1000. Market bias is considered to be neutral when there is a tick reading close to the zero level. I personally consider a tick reading over 300 as bullish and below -300 as bearish. When the tick count approaches or breaks 1000 or -1000 I view it as a bullish or bearish extreme. During volatile markets you are much more likely to see multiple extreme high and low tick counts than you are during less volatile periods. You must take this into account when using the NYSE Tick to evaluate short term bias. On the chart above of the NYSE Tick you can see the tick count remained within +500 to -500 for most of the day, never exceeding +1000 or -1000. This is a representation of a lower volatility day. On days with lower volatility I consider a tick count of +500 or greater to be bullish extreme and -500 or less a bearish extreme. The chart above represents a high volatility day where we see the tick count exceed +1000 and -1000 multiple times. On higher volatility days you must increase what you consider to be a tick extreme. The NYSE Tick is a great day trading indicator and can be use by both trend traders and countertrend traders. A trend trader will look for the tick count to break above or below what he/she considers to be a bullish or bearish zone to enter a trade. 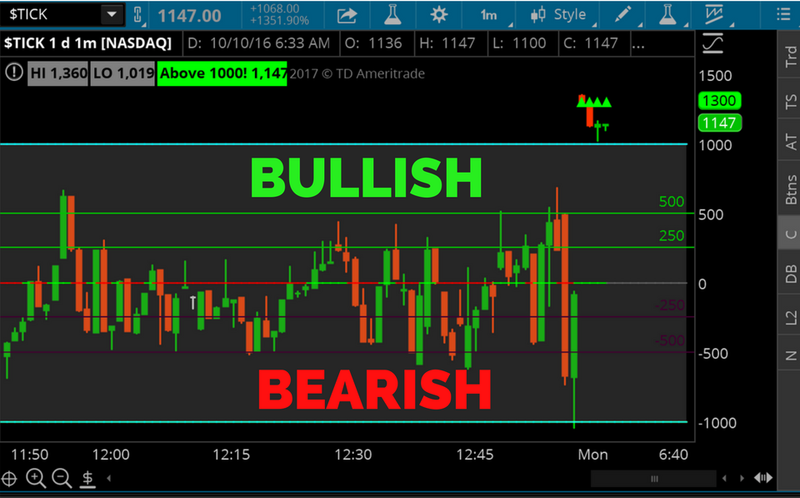 I use the NYSE Tick to confirm potential trade setups, not as a stand alone trading strategy. When I spot a trade setup I look to confirm my entry using the tick count. If I’m looking to go long I want to see a sustained tick count above 300. If I’m looking to go short I want to see a sustained tick count below -300. I consider a sustained tick count when the tick holds above or below 300 for a couple of seconds. Remember that the tick count is a very short term indicator. 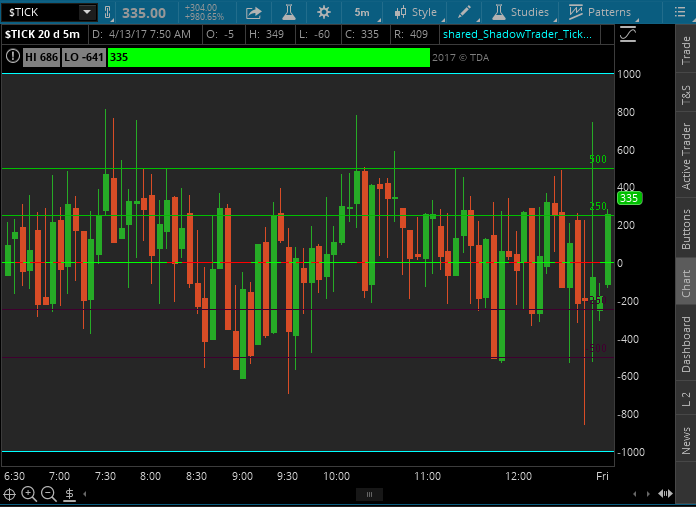 After I enter a position I only look to see if the tick count reaches an intraday high or low. Otherwise the tick count plays no role in determining where I will exit a position. When the NYSE Tick reaches an extreme, +1000 or -1000 on high volatile days, it can be a sign of a potential market reversal. A tick extreme can signal a blow off top or bottom where weak handed traders are blowing out of their losing positions and in some cases flipping their position. Countertrend traders look to cease this opportunity by fading the market. If you are a counter trend trader I still suggest that you look for additional confirmations prior to entering a trade. I personally don’t view the NYSE Tick as a trading strategy itself but there are some traders who do. No matter if you’re a trend trader or a countertrend trader you will want to pay close attention to intraday tick highs and lows. These highs and lows tend to be major market reversals. Even though I won’t exit a trade just because of an intraday high or low, I do put myself on caution and tighten my stops. There are several tick indexes depending on what markets you trade. I personally only use the NYSE Tick even though I trade multiple markets such as the eMini Nasdaq 100. Although the $TICKQ is the better representation of the Nasdaq market, I feel the most robust moves occur when all the markets are in unison. No matter what Tick Index you’re thinking of using I suggest you start by simply adding it to your charts and paying attention to it. It will take time to be able to read the tick count and see how it can play an advantageous role in your trading strategy. Tick Index Indicators are most useful when trading stocks or index futures as they are derived from those markets. However, there are correlations that exist between other markets like Forex and Crude Oil Futures. The NYSE Tick Index can greatly improve your order entries increasing your profits and keeping you out of false moves. Remember to pay close attention to intraday highs and lows. Make sure to let us know how the NYSE Tick or other Tick Indexes have helped improve your trading in the comments below.